Over the past couple of weeks we have been spending time refining our itinerary…yes it’s still developing as we speak with the company finding ways in which we can “follow the brush” in our own research to contribute to what the possibilities of the project will bring for us all. A month ago I felt lucky to have happened across the Butoh workshop with Yoshiko Ohno at the Kazuo Ohno Dance Studio, especially as it is running on our last day altogether in Tokyo. I feel this workshop will provide the “other” to my learnt/experienced practice and be a gateway into another way in which to physically interpret the experiences to come as we head North into rural Japanese landscape. A few weeks on and another gate has opened as the connections that we have made in Kyoto so kindly and generously offer their suggestions of additional places, workshops and artists we should meet. Already I get a strong sense of a rich community of artists in Kyoto who are open to sharing their experience and resources. This mirrors my relationship to collaboration and how I first encountered working at Whitestone Arts. “Her activities are wide-ranging, and she is involved in creating a haunted house for children, additionally creating rural theatre and community-based art projects”. A founding member of Byakkosha—one of the most acclaimed Butoh groups, performing with distinct recognition both abroad and locally. She also designed and produced costumes for them. With their breakup in 1994, she became an independent dancer. In 2000, she started her own dance workshops and created the Butoh company Kiraza. Through the exploration of the avant-garde form of Butoh, supported by the Shinto practice of Tamafuri, “reinvigorating the soul,” a practice seen at the heart of Japanese performing arts, Ima Tenko explores the frontiers of her own art and self. As an inheritor of Butoh, Ima Tenko uses Kyoto as a base to breathe new life and vigor into the form. In 2005, her company conducted a tour of Europe, performing in Spain, France, and Germany, receiving success and acclaim in each country. Every year since 2007, they have been performing to sold-out houses at the historical Gojo Kaikan Theatre in Kyoto. In 2012 and 2013, they also were chosen to perform in the National Arts Festival, sponsored by the Agency for Cultural Affairs, Government of Japan. At the Culture Venture Competition in Kyoto 2010, her work was headlined in the Kyoto Newspaper as “In traditional Japanese theatre, Butoh performance brings fresh poetry to Kyoto City!” and was awarded the Kyoto Newspaper Prize. She is a board member of the the “Question of Butoh” forum, producing and giving workshops and lectures in 2015 and 2016. 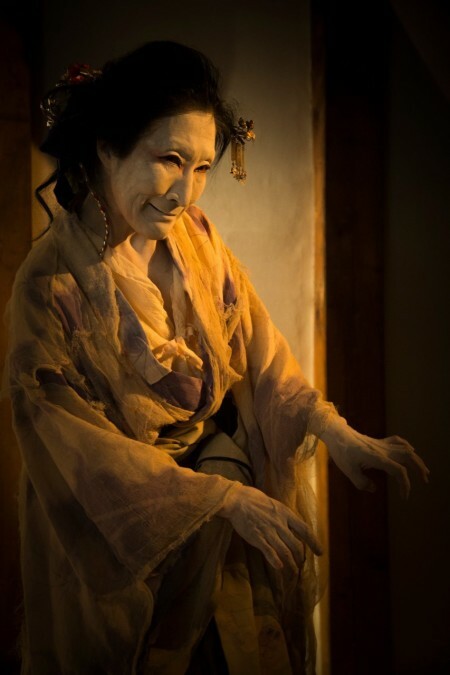 Limited not to just performing, in recent years she has been nurturing and coaching the next generation of Butoh dancers, producing many performers from her studio in Kyoto.